never stop trying to the best of our ability of wanting to enhance and improve for the benefit of all our children and parents. 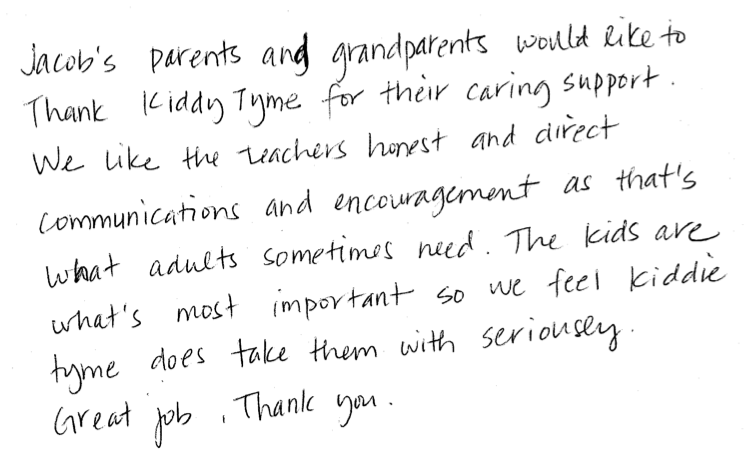 The best way to do so, is from an honest opinion and feedback from our parents, especially those of our graduates. 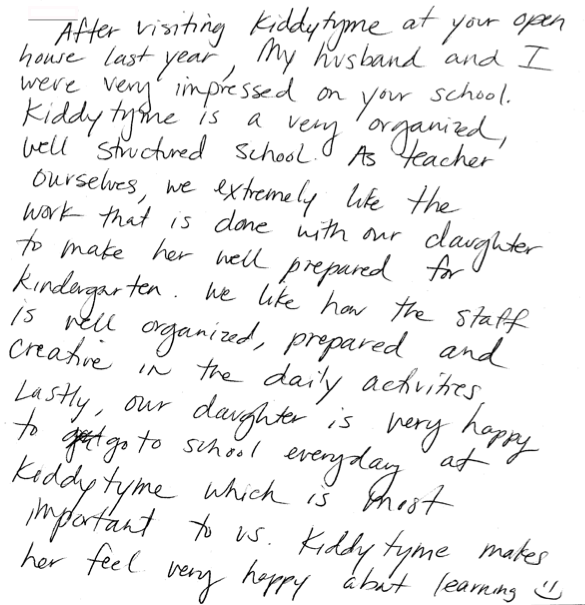 In their own words, a word from our KiDDY TyME Parents and why they chose our school for their child/children and their experiences and impressions they had during their stay with us. My children love this school, my son is always excited to tell me about his day and enjoys doing his homework. The staff is always helpful, friendly and great with kids. Lots of fun activities’ and learning lessons. If I had more children, no doubt they would be attending this wonderful place. If your looking for a daycare/preschool look no further. My girls love it here. 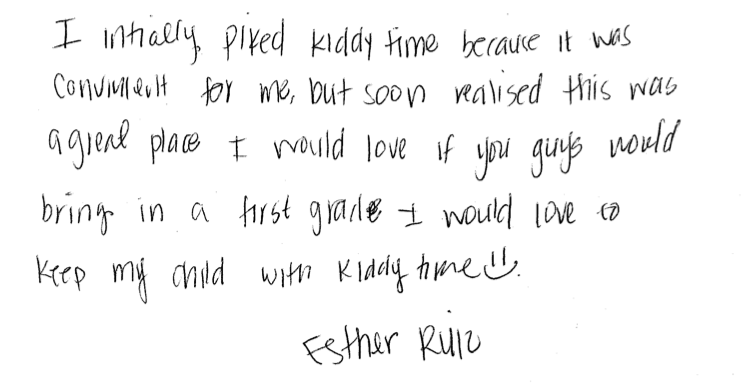 I am extremely happy with the care that my children get here. I never have to worry or wonder what kind of day my girls are having but I know that they are well cared for. Their teachers are so attentive and caring. Everybody seems to go above and beyond to not only care for my girls but all the other kids as well. The director, Ms. Mary leads by example and always takes the time to talk to the parents and answer any questions. I would and have recommended this facility to others because of the great experience we have had here. My son has been attending Kiddy Tyme since he was 3 months old and now is part of the preschool program. Not only does he enjoy attending school but it is obvious that all the teachers and staff adore him. Currently at 3 years and 5 months old he is potty trained, can spell his name (and some other words) and able to trace his name. He really enjoys the summer with Camp when there is activity days such as pool day, reptile day and bounce house day. Mary (Director) and all the teachers have been very supportive when my son was having some medical/developmental issues which required he have a little more attention than most children his age which put this working mom’s mind to rest when I could not be there during the day. Security is also great at Kiddy Tyme with a locked door and someone always in front to check to make sure only authorized people are picking up kids. 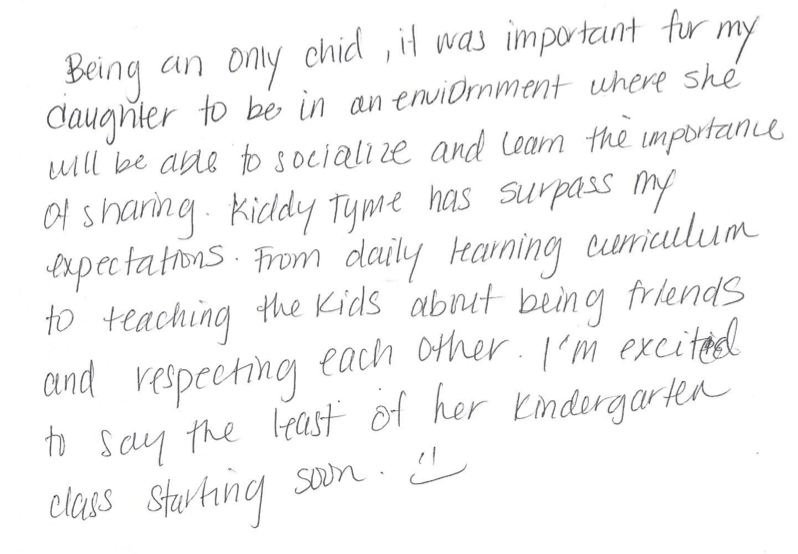 I have recommended some of my co-workers to Kiddy Tyme and they love it as well. All the teachers and staff have been wonderful to our little family. Thank you!